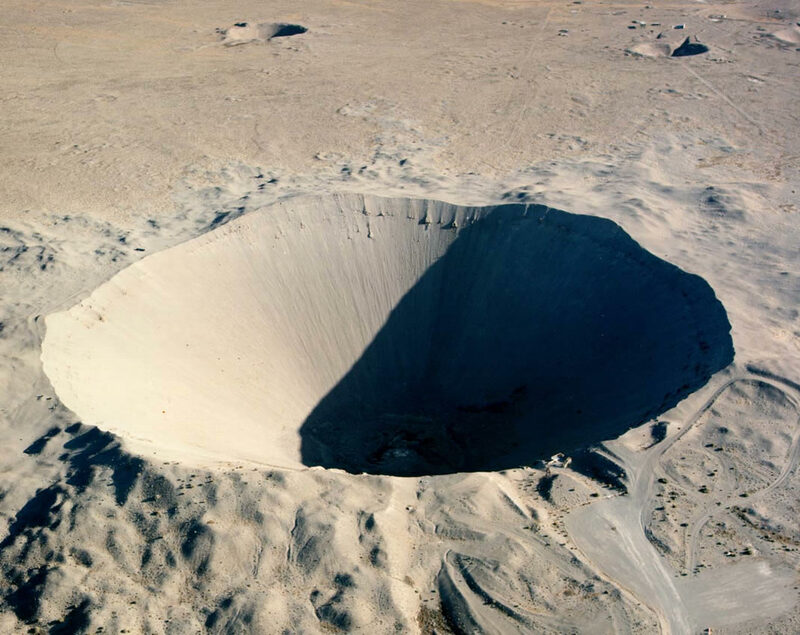 Not a meteorite crater, this was caused by an underground test in Nevada (NDEP). At 09:54 local time this morning, a magnitude 4.7 earthquake hit a region of North Korea 200 miles north-east of Pyongyang. So what? I’ve experienced a 5.0 sitting in my back garden, and it was a curious experience. All I remember thinking was “oooh my first quake!” and “I’ll have to tweet about this!“. Then I quickly forgot about it. Apart from the possibility of making that crack in my bedroom ceiling a bit wider, a 5.0 is memorable, but not particularly damaging. I’m sure that if an unsafe structure is hit by a quake of that size, there might be a little more damage than a few cracks in plaster, but in LA, it was fairly unremarkable. But it is entertaining. So why is there all this fuss about a 4.7 quake deep within the secret nation of North Korea? Well, this is the interesting bit. The location where the earthquake struck doesn’t get earthquakes. As in, seismic activity has been pretty much non-existent for the last 30 years. Compare that with the California shimmies: we have a stonking huge fault (the San Andreas) running right through the middle of our state. That’s not including all the smaller faults that zig-zag the West Coast of the US. I live atop one of the most seismically active regions on the planet (earthquakes and wildfires? Good move Ian! ); we get small quakes all the time. North Korea, not so much. Deterrent? Are you sure? What are they deterring? Judging by the frakked-up satellite-submarine launch in April, the nation’s nuclear missile fleet probably isn’t the best in the world, and there’s not many warheads in the armory. So globally, North Korea isn’t fooling anyone. However, this new test will cause grave concern for the region if the NK dictatorship starts sipping too much of the Kool-Aid. The nightmare scenario would be a nuclear-tipped ICBM dropping into South Korea or Japan. Unfortunately, when you have a crazy person living in a military state, cut off from the rest of the world, all bets are off when they are in charge of the Red Button. North Korea thinks its under such a big threat from the rest of the world. While the reality is the world just wants to make sure this country doesn't get out of hand. Testing nuclear devices underground has just shown this country has taken the next step towards getting out of hand. This is some frightening news and its scary how it affected the financial markets so much. I wonder what the response will be in the next few days over this action. Isn't 6.2 miles under the crust of their country a bit exaggerated? Why the need to go that deep? Rather, it’s made from heavy-duty cotton duck cotton and is lined for added warmth. This type of overall is made for the person that works on heavy farm equipment or machinery where they may kneel down a lot to carhartt coats reach low spots. Previous Previous post: Space or Pizza?